Global conversations on food security have focused for decades on the quantity of food. More recently, the dialogue has come to include the importance of quality and diversity, addressing micronutrient deficiencies and non-communicable diseases related to obesity, alongside persistent hunger. Over the past 50 years, nutritionally rich traditional and local foods around the world have been replaced with staple commodities like wheat, rice, maize and potatoes. While this change has helped feed the world, it has contributed to more homogenized diets, which may be accelerating the worldwide rise in obesity, heart disease and diabetes. 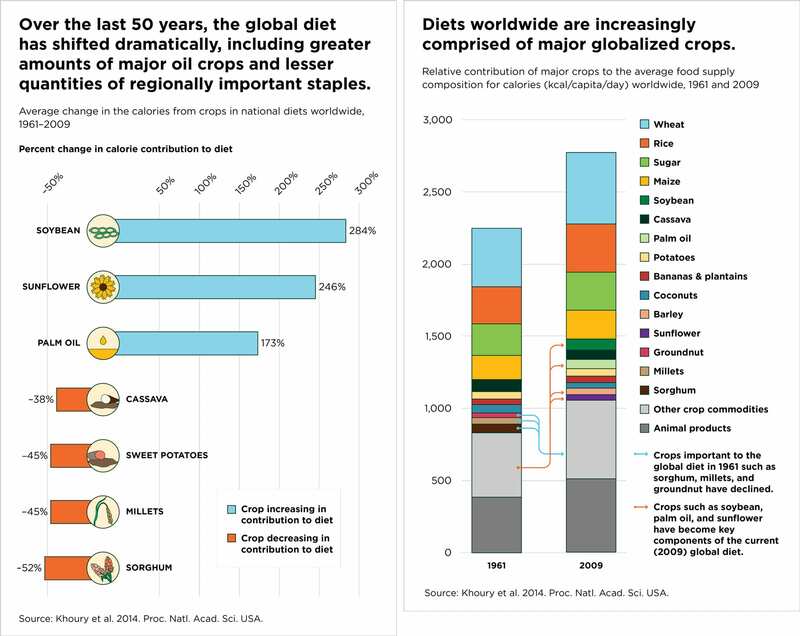 Those well-versed in the topic of crop diversity know that relying on fewer crops in our global food supplies (and our diets) can be harmful for our future food security. (Need an introduction to the topic? Check out this TED video.) It makes us more vulnerable to major threats like drought, pests and diseases, which are likely to become worse in many parts of the world as a result of climate change. In March 2014, Burness Communications released the findings of a major global study by scientists at CGIAR, International Center for Tropical Agriculture (CIAT) and the Global Crop Diversity Trust. The study found that over the last five decades, human diets around the world have grown ever more similar—by a global average of 36 percent. Burness worked with CIAT to develop materials that helped distill the findings—covering over 50 crops and 150 countries—into simple graphics and clear messages suitable for a wider audience. The campaign sought to link the familiar narrative of rising obesity and poor nutrition globally with a largely unknown issue: crop diversity. A global outreach campaign to reporters around the world resulted in stories across dozens of countries and languages. Stories ran in Reuters, BBC Online, NPR, TIME, Los Angeles Times, the Guardian (UK), Slate and NBC News, among many others; all communicated the important findings of the study and what they mean for human health. According to CIAT, “Massive media coverage of the study worldwide contributed to one of its key aims, which was to foster public awareness of the need for healthier diets, based on better decisions about what and how much we eat, and for concerted efforts to reduce the vulnerability of global food supplies through skilled use of plant genetic diversity.” Coverage of the research also led to a collaboration with National Geographic, which produced a full-page diagram displaying the results of the work, both online and in print.